In 2015, 100,000 girls ages 15-24 were infected with HIV in South Africa, compared with 42,000 boys. Soul City Institute for Social Justice created RISE Young Women’s Clubs to help shrink these catastrophic numbers, but calls for more funding and programming for HIV prevention in high-risk populations. Young women are at particular risk. At the National Aids Conference in June 2017, a briefing was held to assess the impact of the clubs run by The Soul City Institute. Operating since 2003, the clubs are active in 9 provinces of South Africa. They provide a platform for the health and well being of youth and adults throughout the region. The focus on the high incidence of HIV in the audience populations has resulted in significant reductions in HIV infection in those groups, even as infection has continued to plague the region. Former members of the clubs are three times more likely to be HIV negative. In sub-Saharan Africa, girls are infected with HIV at an alarming rate putting them at much higher risk than boys in their age group. A stark example, in 2015 alone South Africa counted, 100,000 girls 15 – 24 infected with HIV, compared with 42,000 boys. The Soul City RISE Clubs discuss topics in a way designed to be both engaging for young people and thorough. Discussions range from applying to school, to jobs, to birth control, self-esteem and healthy relationships. Understanding HIV and how to protect against infection is a key part of many discussions. Topics around relationship conversations, counseling and HIV testing are all included. By creating an environment for learning with and from their peer group, the girls who are members of the clubs develop fundamental life skills, and learn to make constructive choices. More than 1,100 clubs operate across South Africa, serving more than 18,000 young women and girls. Underlining the need for education and services, nearby communities are clamoring for new local clubs, according to regional RISE administrators. The monthly RISE magazine, and a mobile app that allows RISE Club members across South Africa to connect with each other, record their progress and track the topics they’ve covered, help to fill the void. 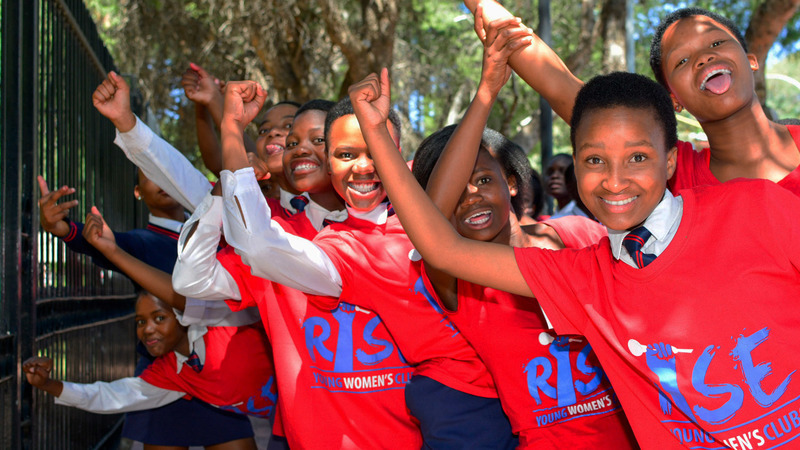 In one village near Pretoria, the RISE Club girls approached providers in the local health center about making services teen friendly, and emphasized the importance of not judging if teens seek HIV tests or sexual health services. The staff responded by offering the clinic space for RISE meetings. On a day when the clinic is closed for patient visits, the RISE members gather to both visit with peers and share important information on female health and sexuality. They reinforce tough choices about the young men in their community and their tendency to be with numerous young women. The consensus of the group to avoid young men who “shop around” helps the young women make hard choices for themselves. A recent presentation noted positive shifts in tendencies of leadership, career planning, conflict resolution and debt avoidance.